I have been asked to present a painting demo on Friday evening, August 3rd, at Madison & Main Gallery in Greeley, Colorado. On this First Friday Art evening, I will be set up with my easel, canvas and paints between the hours of 5:30-7pm. I will be returning to Madison & Main Gallery in Greeley as a guest artist for their 2018 Holiday Show. Opening reception is November 2nd. More details will follow as that show approaches and the weather gets cooler. I am honored to return to Bath Garden Center in Fort Collins as a featured artist. In 2012 I spent the weekend there showing my finished works, having a live painting demo and talking with plenty of amazing people. This time I will be there beginning on Friday afternoon, October 19th. I'll also be there on Saturday, the 20th and Sunday, the 21st. I will again have a display of my paintings, as well as having a live painting demo each day. In February I was invited by fellow artist Rodney Barnes to be a guest artist at Madison & Main Gallery's 8th Annual Bike Art Show. I have recently begun working with acrylic paints and finished two paintings on canvas for this show. The show opens on July 6th and runs through August 31, 2018. Rodney has organized an amazing show that features an outstanding variety of artwork. 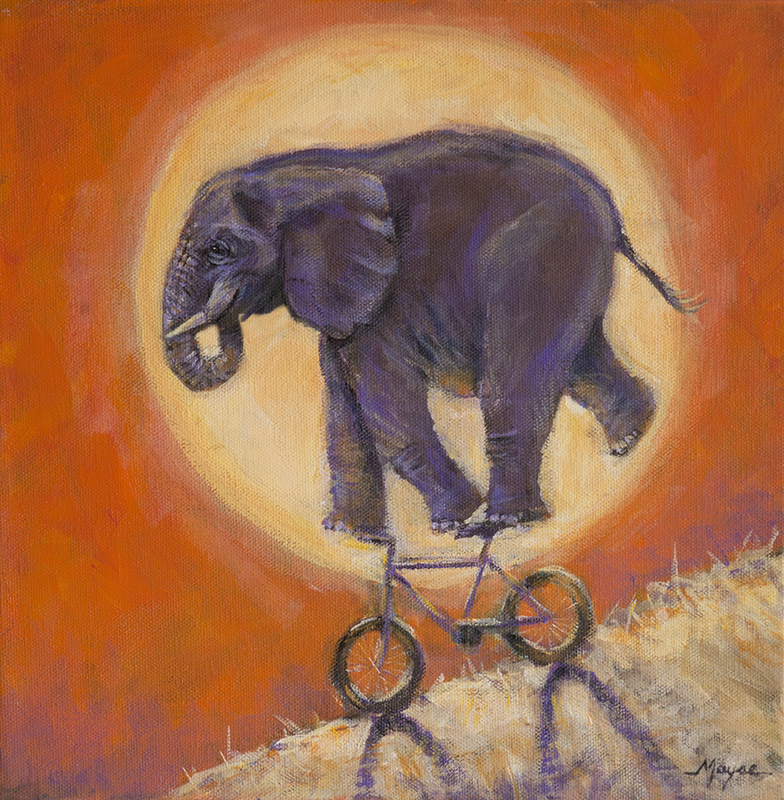 The opening night reception also features a "Bikes on the Patio" show and "Tweed Run" bike ride through Greeley. Joe Lee Parker will provide live music for the event. I am very pleased that they choose my painting (shown below) titled "All Downhill from Here" for their marketing. Four of my paintings are currently featured in the "Power of Love' show at Madison & Main Gallery, 927 16th Street in Greeley. I greatly appreciate being invited to be a guest artist. Please be sure to stop by and see the works of so many talented artists. The show is up form January 2 through February 23, 2018. Several of my paintings were featured at Blue Moose Gallery from mid-June to mid-December 2017. It was a pleasure to have my works shown and hope to be invited back in the future. Over the course of my creative career, dating back to 1980, I have been involved with art and photography. At this stage of my life I wanted to create a venture that would showcase my talents as both and artist and photographer. To share my images and experiences with the world. I have always felt that I wanted to share my experiences in nature with others. Here, I present to you my photographs of the natural world. You will also find a selection of my oil paintings, which are inspired from my photographic images. When thinking of a name for my new venture, I wanted to incorporate things that are very important influences in my life. When it comes to wildlife, my favorite is the WOLF, which I believe is a majestic animal, a survivor, and a leader. Choosing the word RIVER shows my appreciation of flowing water. I find great peace in paddling a canoe or kayak on a calm lake or river. I also enjoy the excitement of paddling the canoe along fast flowing rivers or white-water kayaking through rapids. During a trip a couple years ago to Vancouver Island, it was while riding in an inflatable boat that was zooming across the water, smacking each wave as it hit the boat, spraying ice cold water on my face, that I am reminded how alive being on the water makes me feel. It was an added bonus when we spotted the whale and sea lions. My outdoor inspirations started long ago, while exploring the natural world behind my childhood home in northern Ohio. My parents also liked to take my brother and I camping around the Midwest. They were also always taking us to our grandparents farms in Kentucky. You read about Pooh and The Hundred Acre Wood, my Grandad Mayse did actually have 100 acres to explore. It was full of hills, streams and ponds. My Grandad Eldridge also owned a large farm not far from my other Grandad's that was full of the same type of wonderful terrain. In my adult life, I have been inspired by the writings of John Muir, Aldo Leopold, Jane Goodall, Thoreau, Emerson, and adventurers like Lewis and Clark. Meriweather Lewis and I share the same birthday. I would like to thank my wife and son, my parents, and my brother for their support along this adventurous journey I call my life. Thanks to every family member, friend, colleague, instructor and client who have led me down this bend in the river. Thanks to Gene and Marlee Wobser for sharing your canoe adventures in the North Country. I hope each visitor to my site may find a connection between the adventures they may have had... or are seeking, and my images and artwork. Thank you for coming along on the journey.